One of the things that I’ve noticed in researching family history is that we often have very little sense of where family members lived. We’ve sometimes visited the towns or houses where they lived, but things have often changed a lot since they were there, and it is often difficult to picture what it was like in their time. It therefore seemed to be a good idea to record where we live now, our neighbourhood, before it changes and becomes unrecognisable. This is where we live, at the corner of Owen Avenue and Slater Street, Kilner Park, looking south down Owen Avenue. We’ve lived here for over 25 years, so the trees have grown quite a bit since we first came. The green fence is our third fence. The first one was a low diamond-mesh one, and after 13 break-ins we replaced it with a higher one in 1991. The thorn tree in the corner of our garden was the envy of our previous neighbour, who said he wished he could include it in his garden before we moved in. It’s now about twice as big as it was then. The photos were taken on 5 September 2013, early spring. Most trees are still winter-bare. Others are just beginning to show new leaves. The picture above is from the other end of Owen Avenue, on the corner of Matterson Street, looking north. 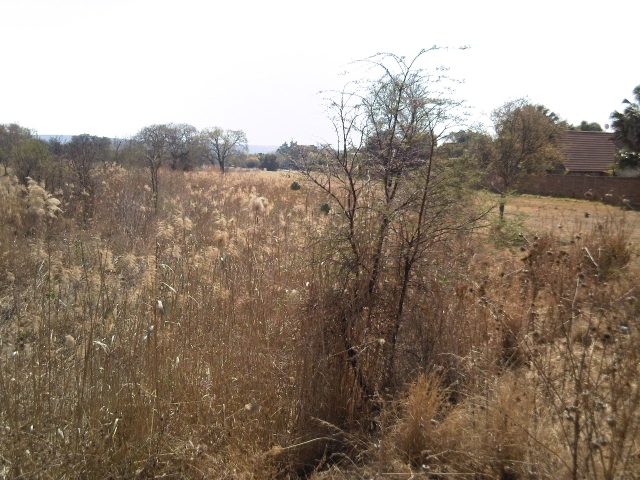 The open ground on the right is a servitude for the electricity pylons that go right around eastern Pretoria. Looking west down Matterson Street. This is the way in and out of our bit of Kilner Park, the only way in and out by car. At the end can be seen the N1 freeway bridge. On the left is the railway line. Not much use to us, as we are almost exactly halfway between stations. N.A.R. 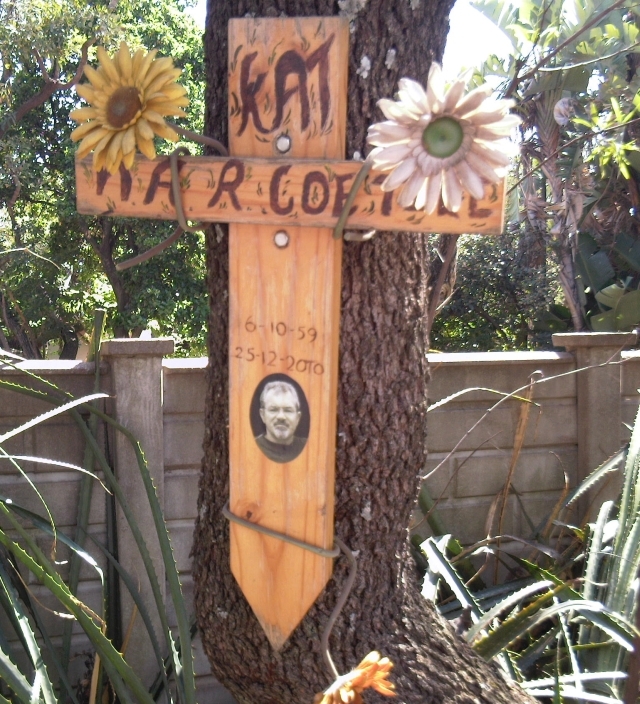 Coetzee was presumably he killed in a road accident nearby, though that seems a bit strange in our quiet little cul-de-sac, which gets very little traffic. Who he was, or how he died, we don’t know, but obviously someone still misses him. After a dry winter there isn’t much water in Hartbees Spruit, seen from the bridge in Matterson Street, and the reeds are still winter-brown. But you can see, if you look carefully, a couple of weavers building a nest in the tree on the right. There are two nests, but I’ve heard that if the female weaver is not satisfied with the nest, she demands that the male build her another, so there may just be one pair of birds. My destination, about 2,5 km from our house, was Queens Corner in Queenswood, the shopping centre, where I had to pick up some medicines at the chemist, a 50 minute walk. It was built on one of the sports fields of Clapham High School, and opened in about September 2000, so it’s been there for 13 years,and sometimes it feels as though it has been there for ever. The chemist is part of a chain called Pharmavalu, and when it opened we continued going to the one in the other shopping centre across the road, and wondered if there would be enough business to support two of them. The result was that the original one was forced to close down. It was originally called Queenswood Pharmacy, and later became part of a chain called Hyperpharm, but even then it couldn’t survive. Old shopping centre in Queenswood, to the east. Soutpansberg Road on the right. I walked back down Soutpansberg Road. Both Queenswood and Kilner Park were built on land that used to belong to the Methodist Church, and apparently one of the conditions was that no bottle stores or pubs should be built there. But some one must have gone to some trouble to remove the restrictions in the title deeds, because there are now several bottle stores in the area — they don’t seem to suffer from competition as the pharmacies do. Kilner Park was named after the Secretary of the Methodist Missionary Society, John Kilner. It was the site of a Methodist educational centre, called the Kilnerton Institute, but, like the theological seminaries of several other denominations, John Wesley Seminary (part of Kilnerton) was forced to close and moved to Alice in the Eastern Cape in 1963. It reopened on its old site briefly after the end of apartheid in 1994, but moved to Pietermaritzburg a few years later. 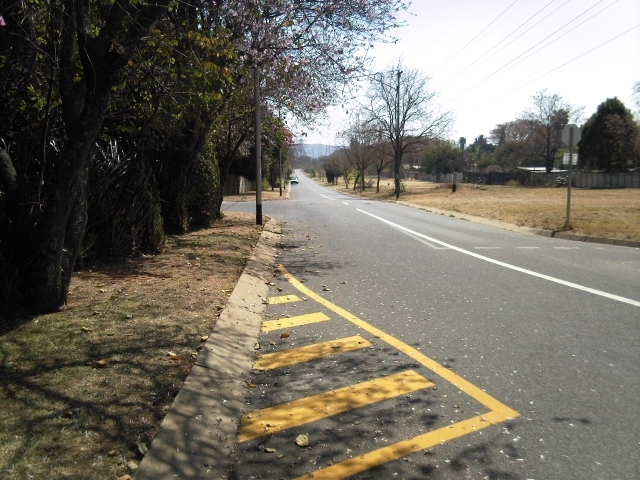 The jacarandas that line Soutpansberg Road are bare now. They are always the last to lose their leaves in winter, and the last to bloom in spring, towards the end of October. I crossed C.R.Swart Drive. 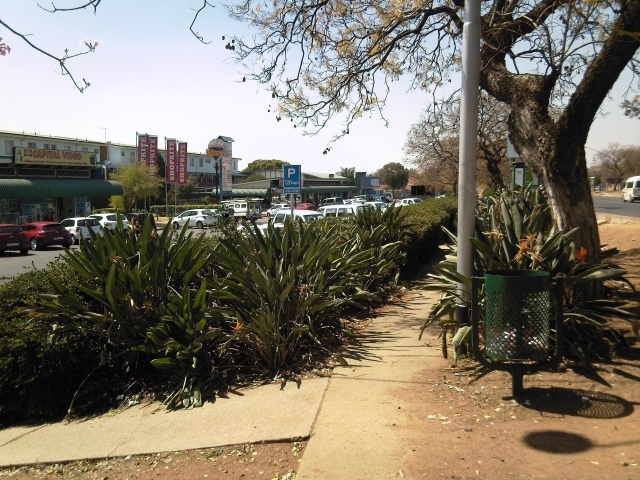 It used to be called Kilnerton Road, but was renamed by the old Pretoria City Council just before the end of apartheid, after the former National Party Minister of Justice who enforced so many of the apartheid laws, including the closing of the Kilnerton Institute. 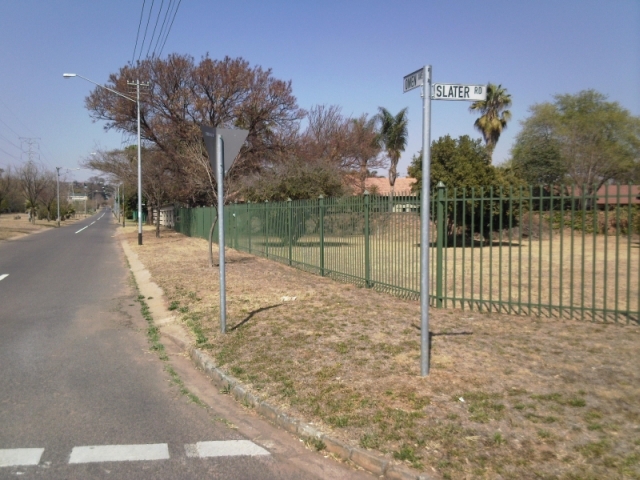 When Pretoria was incorporated into the new megacity of Tshwane the new council renamed several roads, but not this one, which remains as an insult to black people and a monument to the destruction of black education in South Africa. 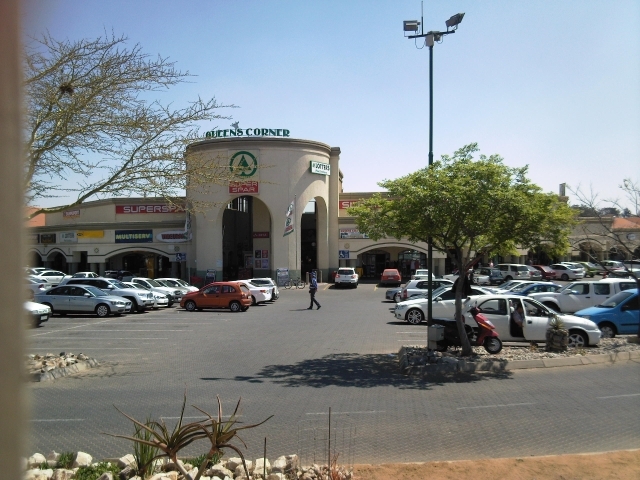 The Kilner Park shopping centre is much smaller than the Queenswood ones. When we first moved here in 1984 it had a tea room (convenience store) on the right, called Tony’s, where our son Simon used to go to play arcade games like Ghosts ‘n Goblins. It was later taken over by someone else, and eventually incorporated into the Casbah Roadhouse, which opened some time in the late 1990s. We wondered if it would survive long, being off the beaten track, but it produced good food and cheap with generous servings. Their hamburgers had real meat, and one could get a large curry and rice for R18.00, Now the large curry and rice costs R120.00 and the hamburger patties are mass-produced, over-salted and tasteless, and probably consist of beef nostril and imported kangaroo offal. There have been several restaurants there. When we moved here in 1984 it was called the Count du Barry, and had a picture of a bloke riding on a shrimp. We never went there then. But it was taken over by a Yugoslav called Misha, who painted Yugoslav scenes on the wall, of Dubrovnik harbour and shepherds in the hills. He produced good pizzas, and flying saucers (pizza bases with no cheese), and a Yugoslav dish for carnivores, which consisted of 12-13 sausages with onions. Delicious stuff, but exceedingly filling. He also continued some desserts from the previous owners, notably the “Count’s Coupe” -made with ice cream and cherries. Then Misha l;eft, and the name changed to “Peasant’s” (they kept the pictures of Yugoslav rural scenes). It was replaced by McLaren’s, which replaced the picture of Dubrovnik with a large and badly-painted Scottish flag, which seemed unnecessary vandalism. We went there for Christmas lunch once, after church, and when they served tinned fruit salad for an exorbitant price, decided never again. They did, however, give each of us a cheap wallet as a gift, and I still use mine, thought much of the imitation leather covering has worn off. The restaurant later became a Blue Bulls fan venue (the local rugby side), and is now the Jock of the Bushveld. They advertise cheap lunches on Thursdays, and I’ve been meaning to try them some time, but have yet to get round to it. 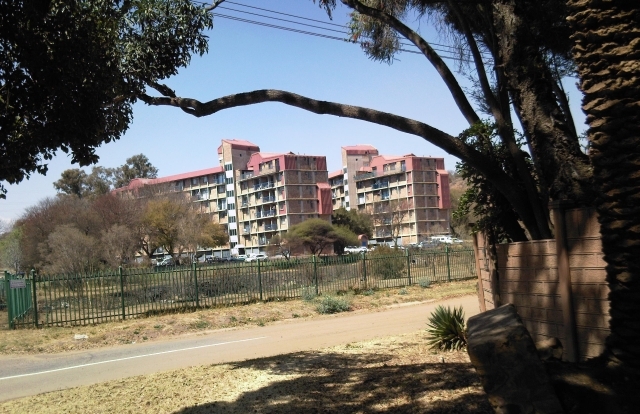 On the south side of Matterson Road, beside the Hartbees Spruit, is North Shore flats, which, if I recall correctly, were built about the time we moved to Kilner Park at the end of 1984. 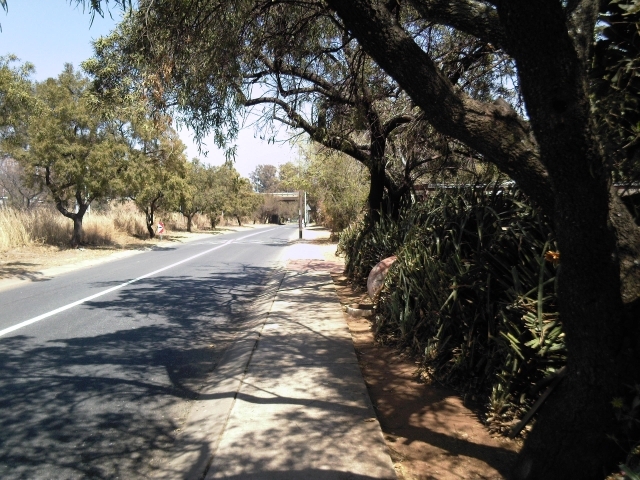 And so back across the Hartbees Spruit, and home. I don’t know if anyone has a photo. It has changed hands several times since then. It became Peasant’s, and kept the paintings, but when it became McLarens, they were gone. Hi, you mention the heritage of the name Kilner Park, Any idea why Queenswood is called Queenswood? Is it just a reference to Queen Elizabeth? In which year were these suburbs started?